Karnataka Board 10th Result 2019 - Karnataka Secondary Education Examination Board (KSEEB) is the official body to declare the Karnataka 10th Result 2019. Apart from the 10th board result, the authority is also responsible for declaring the results for 12th class as well. The Karnataka Board had earlier uploaded the SSLC exam timetable on its website for the students to prepare accordingly. As per the timetable, the 10th board exams will commence from March 21 and will end on April 4, 2019. Now that the students have the exam date sheet, they are curious to know the SSLC Results 2019 Karnataka date so as to decide their stream in the senior secondary level. The Karnataka Board has refrained from revealing the exact dates of the Karnataka Board 10th Result 2019, however considering the last year result date; students can expect the Karnataka SSLC Result 2019 in the first/second week of May, 2019. Last year the result was announced on May 7. Upon formal announcement, the Karnataka Board 10th Result 2019 will be available on the official website- karresults.nic.in. Alternatively, the SSLC Results 2019 Karnataka will be made available on JagranJosh through a live link to access the result. Here in this article, JagranJosh will bring all the latest news and developments pertaining to the Karnataka Board 10th Result 2019. Students who do not want to miss out on their result should bookmark this page for future reference. As stated above, the Karnataka Board has refrained from announcing any official date for the Karnataka 10th Result 2019 but going by the unofficial reports, the Karnataka Board SSLC Result 2019 can be expected in the first week of May, 2019. Many experts have suggested that the board will follow the annual academic calendar and will declare the Karnataka SSLC Results 2019 in the first week of May, 2019. Last year, the Karnataka Board SSLC Result 2018 was declared on May 7. As per the JagranJosh experts, the students should expect the Karnataka Board 10th Result 2019 around the same time this year too. The KSEEB and the Department of PUE, Karnataka will be publishing the Karnataka Board Result 2019 online on their website. However, due to high traffic volume, these websites might face some technical delays and problems. To avoid any delays on the day of the Karnataka Examination Results 2019, we would be providing the Karnataka SSLC Result 2019 on our website. The candidates alternatively may check their Karnataka Board SSLC Result 2019 on the result pages specifically designed for the Karnataka Board Results 2019. This will provide respite to the students from the slow and stagnated servers when the traffic on the official website exceeds the limit. The JagranJosh Karnataka SSLC Result 2019 page will provide you a portal linked to the official result website page in order to give you faster result with all the more options. In these hours of excitement and nervousness, one thing that gives solace to the students is the last year's statistics. In order to calm the nerves of students expecting the Karnataka SSLC Result 2019, we have presented some key facts and figures below. These statistics will help you in setting realistic expectations when it comes to the SSLC Result 2019 Karnataka. As per the general trend, the experts at JagranJosh are expecting Karnataka SSLC Result 2019 to be better than the previous year. In the past few years, the number of participants has increased but the overall pass percentage suffered in the previous Karnataka SSLC Results. But parents and board officials are expecting a better result this time around. 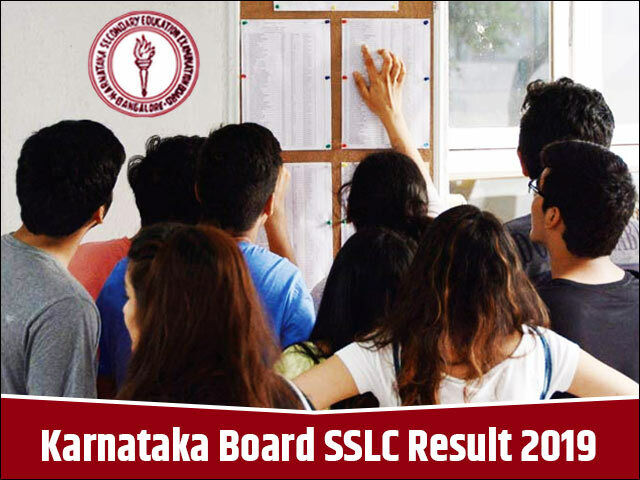 Karnataka Board 10th Result 2019- What Next? The students should download their Karnataka SSLC Result 2019 once they are displayed on their computer screens. This can be used at the time of admission process in the colleges and schools and are considered as provisional until the originals are submitted for verification. However, the students must also remember to collect the original scorecards from their respective schools as a printed or downloaded copy of SSLC Result 2019 Karnataka will not be considered as an officially valid document. In case, the students find any discrepancy in their mark sheets they should connect to their concerned institution or may contact the dedicated student helpline started by Karnataka Secondary Education Examination Board (KSEEB) or Department of PUE, Karnataka. After the Karnataka SSLC Result 2019 is announced, not everyone will be in a celebratory mood. Post the declaration of Karnataka Board 10th Result 2019, the board will also notify the date and process for re-evaluation for the students. There may be instances where a student has performed exceptionally but was let down by the upcoming SSLC Results 2019 Karnataka. Such students will be given the opportunity to apply for re-checking process. The re-evaluation date will be announced soon after the Karnataka 10th Result 2019 is announced on the official website. In case the marks differ post the re-checking, the same will be updated on the official mark sheets. While for those who do not manage to score the passing marks in one or more subjects will be given another chance to clear the Karnataka SSLC board exams. The Karnataka Board will conduct the compartmental exam soon after the Karnataka SSLC Result 2019 is declared. The SSLC supplementary exam is generally conducted in the month of June. However, JagranJosh will make sure to timely update this article with the exact dates of the compartmental exams. The detailed process and date will be uploaded on the official website as well as here in article. The Karnataka Secondary Education Examination Board (KSEEB) was established to function as a regulatory and supervisory board, to formulate and implement education policies of the Karnataka Government. The KSEEB is in existence since the year 1966. Its jurisdiction includes formulating education policies, school syllabus structuring, yearly examinations for academic evaluation, grading and recognition of schools in the state of Karnataka. The Karnataka SSLC Board chairman confirmed that there was no leak of question paper after images were circulated on WhatsApp the night before the examination. Read the details below. Three separate incidents saw a leak in the Mathematics question paper of Karnataka SSLC on WhatsApp. Read more for complete details. The Kannada language question papers of Karnataka SSLC examination were leaked online 30 minutes prior to the end of the examination. Read more to get complete details.